[title] is the [number] book in the LEFT AT THE ALTAR series in a collaboration of six New York Times Bestselling Authors: J. S. Scott, Ruth Cardello, Raine Miller, Sawyer Bennett, Minx Malone, and Melody Anne. I adore Ruth Cardello and ‘Almost a Wedding’ is a quick, emotional, sweet fun read. Its part of the ‘Left At The Altar’ series a standalone spin-off from THE BACHELOR TOWER series but totally can be read alone. 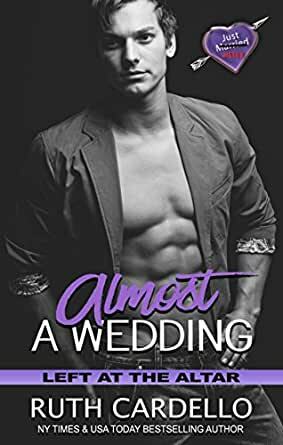 Audrey and Barrett find romance at the wedding that never was... while Barrett is the best friend and the best man he is a pessimist, with baggage and a painful past. Optimistic and sweet Audrey had is an accident interrupt her structured routine. Amidst a disappearing groom, a doomed wedding and emotional circumstances, fate plays matchmaker and it’s a great fun to be part of. Love Ruth Cardello and this one a quick easy read. Loved this story from Ruth Cardello about Barrett Natick, best man for his friend Paul, the groom who is attempting his fourth try at getting married without running away. He meets Audrey Enfield, maid of honor and best friend to Isa, the bride. Barrett, handsome, very wealthy, had a very hard start in life, driven, closed off, has zero interest in any relationship with a woman. Audrey, beautiful, insecure because she has curves, is a web designer, not interested in a relationship now but some day wants marriage and children. Barrett and Audrey find they have very hot chemistry however Barrett makes his views very clear no relationship whatsoever. Really enjoyable read that will keep you quickly turning pages to see how things with the wedding progress as well as the budding romance between Audrey and Barrett. I always preorder whenever I know Ruth has a new book out because I am never disappointed and that held true with this story. What a great read and another awesome story in the series Left at the Altar. Barrett is the best man and Audrey is the maid of honor at Paul and Isa's wedding. Barrett doesn't do relationships and comes across as not really caring about much but he is sent to find the missing maid of honor and helps Audrey out with several little problems she is having. When Barrett, Zeke and Gage need to find the missing groom....he checks Audrey's room thinking Paul is there (he's not). Audrey is very attracted to Barrett and Barrett gives Audrey a melting hot kiss. I loved everything about this story. I loved when he accidentally calls her Anna and she flows with it. I love how protective her brother was. And don't get me started on when he visits his mother (melted my heart and made me cry). Ruth Cardello has a winner here. It was great to see Lia and Zeke again from book 1 I can't wait to read Gage's story in Book 3. I liked Barrett and Audrey, they were actually two people cut from the same cloth. Both fathers not a part of their lives growing up. They were strong and independent and determined to be successful in life. They both attend their best friends wedding, best man and maid of honor. The wedding hits a few snags and doesn’t happen but what did happen was they got to know each other. 5.0 out of 5 starsAnother Great Read!! This is a short sweet love story that will keep you engrossed until the end. Audrey and Barrett meet at a wedding venue of their best friends. The bride and groom are having trouble so Audrey and Barrett try to figure out how they can help them. Barrett is totally not into weddings because of his past. Audrey isn't even thinking of getting married. This is a fun story and I enjoyed how easy it was to get involved in the story. I recommend this book of you are looking for some laughs and romance.